I make homemade sauces whenever I can, usually it’s a combination of pantry items and whatever fresh spices or herbs I have. When short on time, or when my ingredients are short, I use good quality Asian sauces. 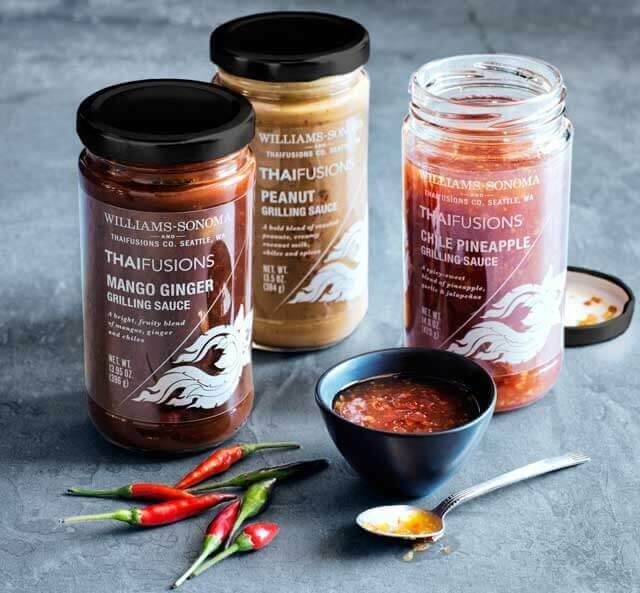 We just discovered Thaifusions Grilling Sauces, sold nationwide exclusively at Williams Sonoma and Sur La Table. ThaiFusions is a family owned company, inspired by their restaurant, Toi, in Seattle. The recipes for these handcrafted sauces came from the family’s mother. We tried a trio of sauces: Mango Ginger, Peanut, and Chile Pineapple. What sets ThaiFusion sauces apart from other is the intenseness of fresh flavor – without overwhelming your palate. Each variety has just the right amount of what I call the 5S’s: spicy, sweet, savory, salty and sour – the hallmark of great Thai cooking. We paired the Mango Ginger with thinly sliced pork on skewers. The Chile Pineapple was slathered on jumbo shrimp, ready for the grill. Finally, the Peanut Grilling Sauce was used as a dipping sauce for lemongrass beef skewers. You can buy the sauces at Williams Sonoma or Sur La Table. Each jar retails for $12. Thaifusions provided review samples and product for this giveaway. Giving away a trio of Thaifusions Grilling Sauces.